Linked Learning Academy of Cinematic Arts - Lawndale H.S. Advanced Academics Academy - Leuzinger H.S. Biomedical Careers Academy - Lawndale H.S. Culinary Careers Academy - Leuzinger H.S. Environmental Careers Academy - Leuzinger H.S. Hawthorne High School of Manufacturing & Engineering Marine Science Academy - Lawndale H.S. Multimedia Careers Academy - Leuzinger H.S. School of Criminal Justice - Hawthorne H.S. 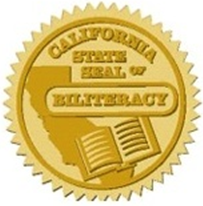 Beginning with the 2015-2016 school year, the Centinela Valley Union High School District is proud to award the California State Seal of Biliteracy to all seniors who graduate having demonstrated proficiency in both English and a language other than English. Those who qualify for the award receive a state Seal of Biliteracy affixed to their diploma, inclusion of the award on their official transcript, and special recognition during their school’s graduation ceremony. Successful completion of all CVUHSD high school graduation requirements, including successful completion of all English requirements with a minimum overall GPA of 2.0. Score of 2583 or higher on the 11th grade English Language Arts/Literacy portion of the CAASPP/SBAC exam. Score of 600 or higher on a SAT subject test in any language other than English (please attach appropriate documentation to use this option). If you are currently still designated as an English Learner (EL) student, you must also have achieved an overall proficiency level of Early Advanced or higher on the California English Language Development Test (CELDT), which may be administered an additional time, as necessary.